A retro-style computer that functions like the Altair 8800 and can run original, unmodified software. The simplest Altair configuration that could run 4k BASIC was the 8080A CPU board, at least 4K of RAM, and a serial IO interface. The 6850 UART was used in the 88-2SIO serial interface boards. 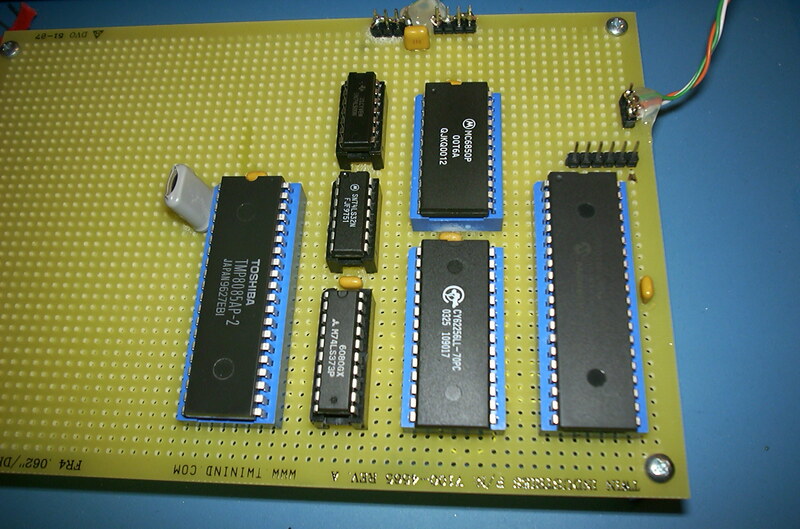 Version 1 is a minimal hardware configuration that will run Altair BASIC. It consists of an 8085 CPU, a RAM chip, a 6850 UART, a latch and some glue logic and a PIC microcontroller. On power up the PIC loads the Altair bootloader into RAM, then resets the 8085 and starts it running. BASIC can then be loaded through the 6850 serial port. Version 2 adds a little more glue logic to allow the PIC to control the 8085 like an Altair front panel. It can perform the run/stop, single step, deposit, deposit next, examine and examine next functions. Version 3 adds a floppy disk emulator using an SD card for storage. The hardware emulator is register-compatible with the 88-DCDD Altair Floppy Disk System. This allows all of MITS disk software (disk BASICs and Altair DOS) to run unmodified. The floppy data is stored on the SD card using the FAT32 file system so disk images can be easily transferred to other computer systems. The disk images are stored as files which are straight binary images of the floppies. This is the same format as the Altair32 emulator so the images provided in the emulator can be used directly and exchanged between the emulator and the Mini-Altair. With the disk emulator, the Mini-Altair connected to a dumb terminal becomes a complete stand-alone computer system without the need to ever connect to another computer in order to operate. Version 4 expands the RAM from 32K to 64K. This allows versions of CP/M that are configured for more than 32K of RAM to run. http://www.altair32.com Rich Cini's Altair emulator. Not only is the emulator very useful, but it includes all the different versions of Altair BASIC, the bootloaders, the Turnkey PROM monitor, BASIC programs and more. http://www.solivant.com/altair_bootloaders/index.php?album=altair_bootloaders&pagen=0 Geoff Harrison's excellent explanation of the boot process with disassembly of the bootloader. http://www.altairkit.com Grant Stockly's Altair 8800 kit. http://www.brielcomputers.com/phpBB3/viewtopic.php?f=18&t=468 Vince Briel's Briel Computers Forum where this project got started. http://altairclone.com/ Mike Douglas' superb Altair 8800 replica. The support page has a full selection of Altair software as well as CP/M.